Last year I visited Bali for a month and fell in love with it. It’s truly one of the most amazing places I’ve been to with warm people, stunning nature, fascinating culture, amazing vibes and delicious food. Indonesia is also the number one producer of coconuts in the world which was one of the reasons for me to go there. I learnt so much about coconuts: how they are grown, picked, opened and how the different coconut products are produced. 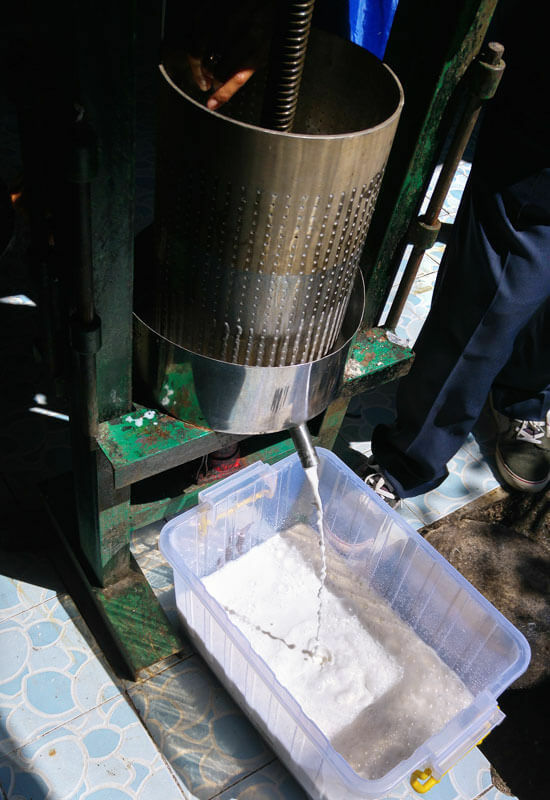 One of the highlights for me was to learn how to make cold-pressed coconut oil. 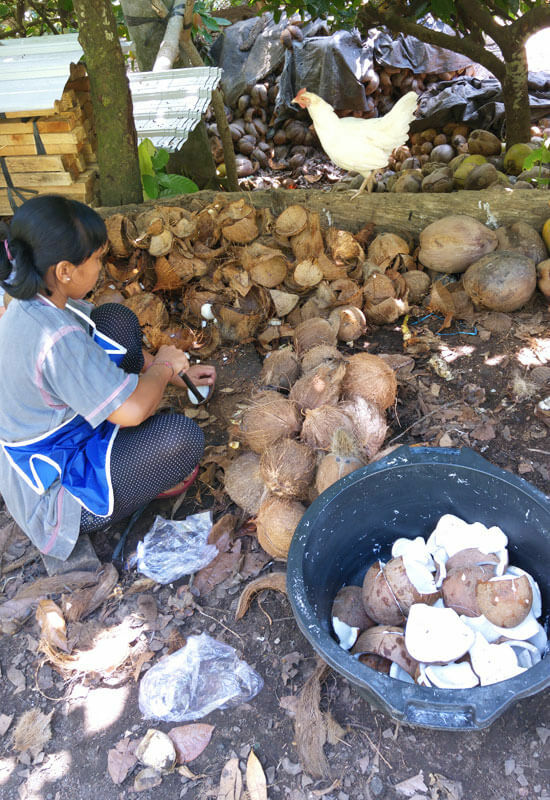 Our local friend Ketut took us to his cousin to learn about Indonesian coconut oil production. 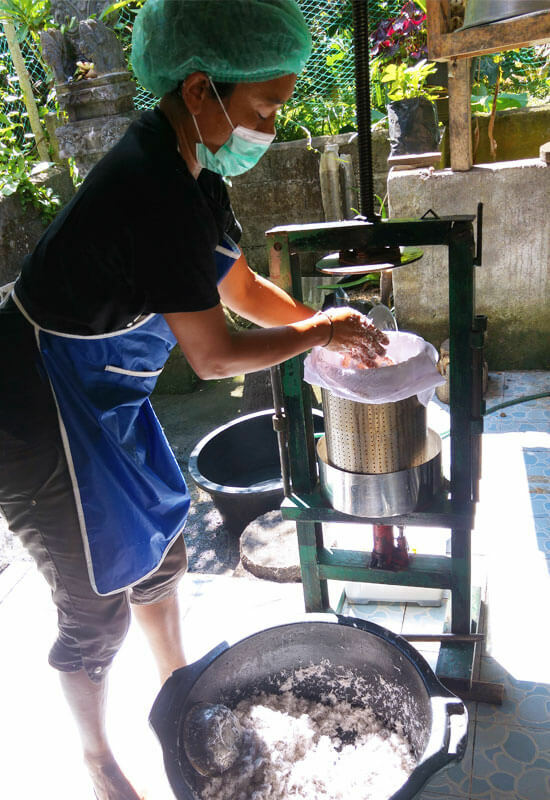 His cousin runs a family-owned coconut oil company in central Bali and showed us around. I was really impressed when I saw how much time, work and love is put into this process. Especially because most of it is done by hand. 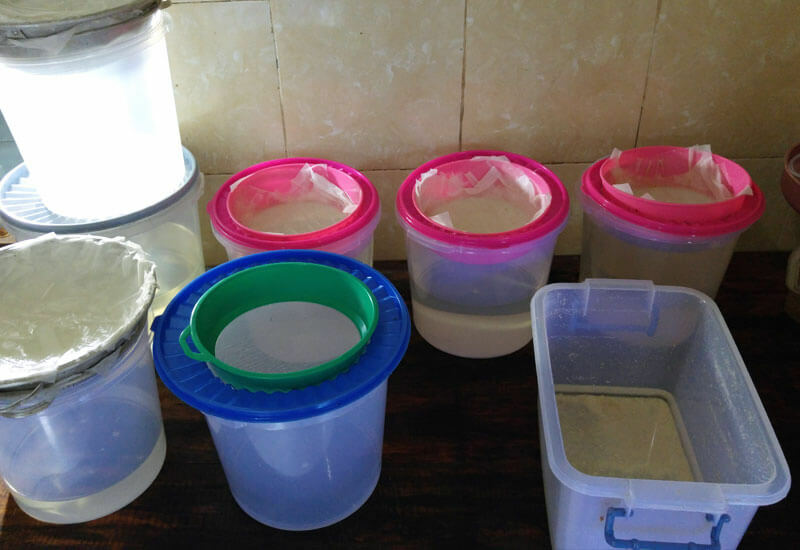 There are different types of coconut oil and production methods. Cold-pressing is one of the most natural ones. It involves the minimum amount of heat and only contains fresh coconut and purified water. This results in a very pure, cold-pressed virgin coconut oil with a high nutritional value. Growing: It takes 6-10 years for the coconut palm to grow its first fruit. 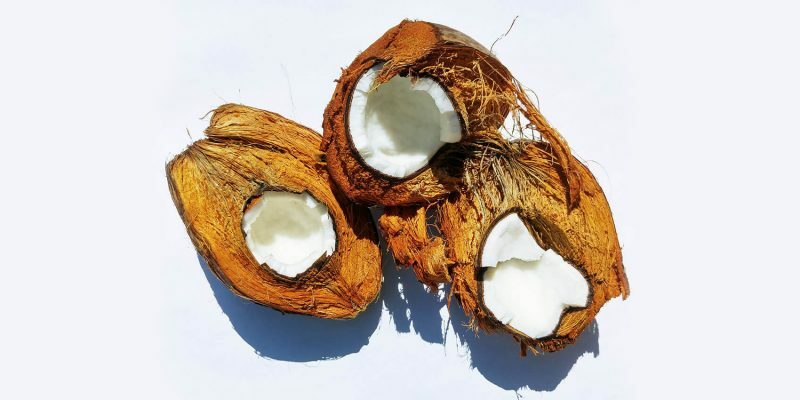 Then it takes about a year to grow the fruit into a mature coconut, which is the type of coconut that is used to make coconut oil. A coconut tree can produce up to a 100 coconuts per year under optimal conditions. You need about 10 coconuts for 1 liter of cold-pressed virgin coconut oil. So the average coconut tree can at its best produce 10 liters of coconut oil per year. Wow. Picking: Coconuts are traditionally picked in two ways. 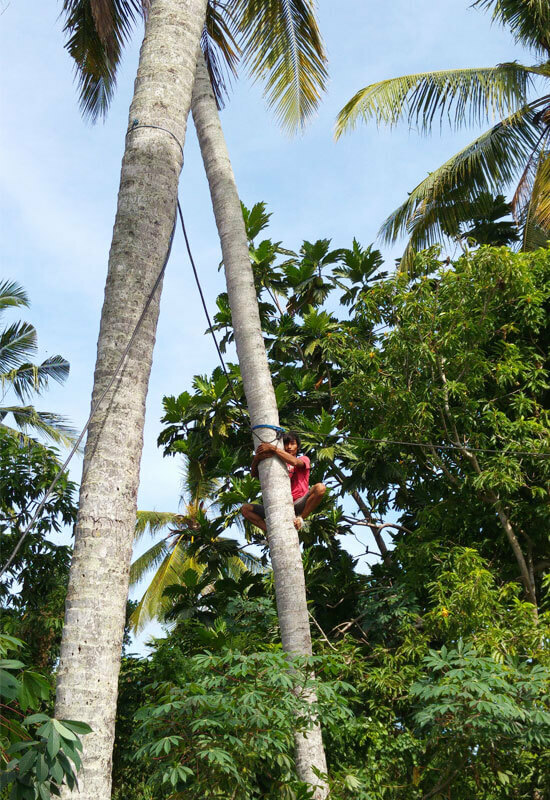 The first is to climb the trunk of the coconut palm and pick the coconuts one by one. The second is to cut a whole coconut bunch at once. This happens by hand or with the help of a pole pruner. A net or blanket is used to throw the coconuts in. Opening: It takes some work to get to the coconut meat. You have to open the coir, husk and finally the shell. Removing the coconut husk happens with a metal blade. A metal stick is then used to crack the coconut shell open and remove the coconut meat. Everything happens by hand. The coconut water of the mature coconut is poured into the soil. 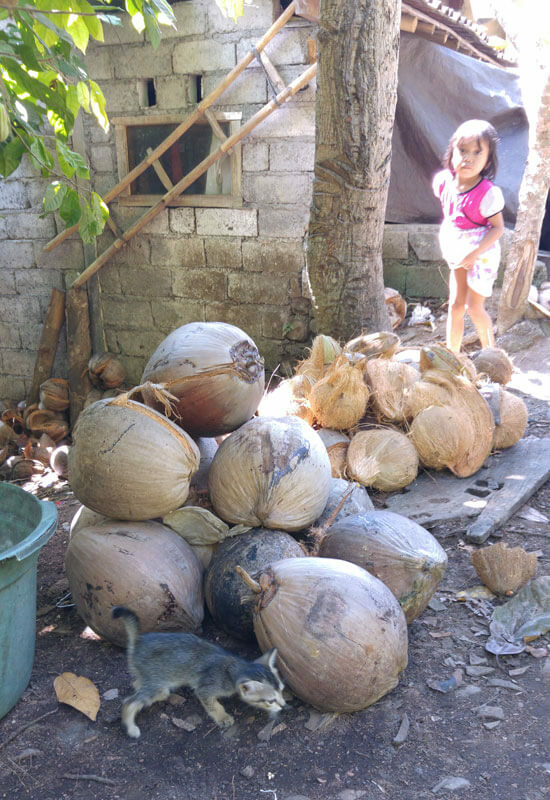 Usually only the water from young, green coconuts is used to drink. However you can drink the water of most mature coconuts as well, which is what we did. They then remove any possible bad parts and wash the rest of the coconut meat with purified water. 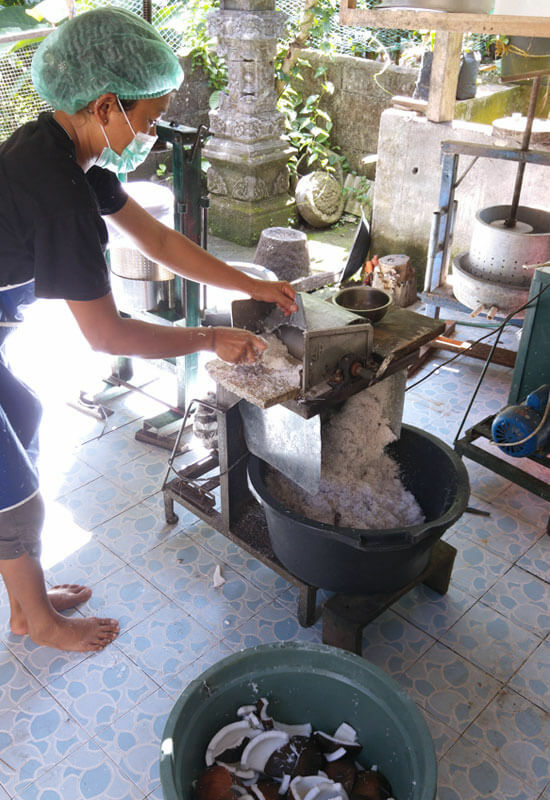 The coconut meat is grated in a mechanical machine, to make it easier to press the coconut oil out. 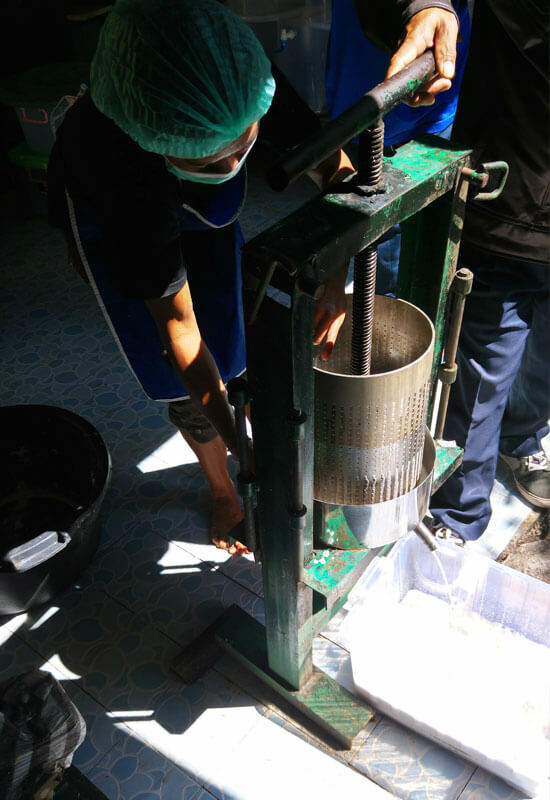 The grated coconut meat is then pressed through a mechanical press that is also operated by hand. 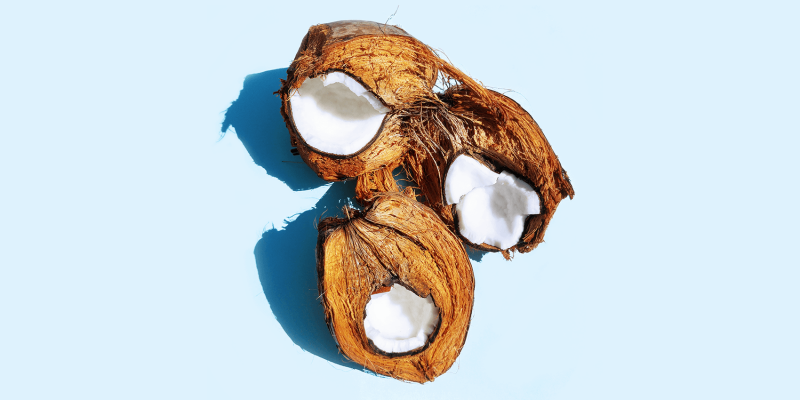 To qualify as cold-pressed virgin coconut oil, the pressing happens in a carefully controlled heat environment, not exceeding 49° C / 120° F.
The grated coconut can be pressed more than once. You just add purified water to get more oil out. The cold-press process is very pure. It preserves the maximum nutritional value as well as the natural coconut taste and smell. No cooking, heating or chemicals are used during any part of the process. Oil separation: The liquid is poured into big plastic containers. 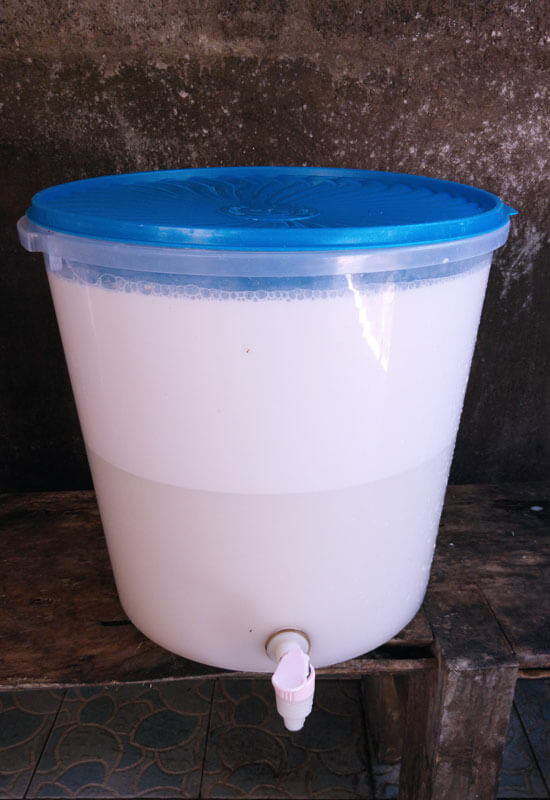 It takes approximately 6 hours for the oil to separate from the coconut milk. After 3 days they take the oil out of the big container and pour it into smaller containers. They then filter it 5-6 times until it’s completely pure. The coconut oil is left to sit up to 2 weeks when it become the final product: handmade cold-pressed virgin coconut oil. The coconut oil is now ready for distribution. This company packs and sells it under is own name, but some companies distribute the oil through private labeling. This is usually a big coconut oil producer who delivers coconut oil to other companies who sell it under their own name. Private labeling makes it harder to know where and how an oil was produced. Most of the virgin coconut oil produced in countries such as Indonesia is exported to the west. Being able to witness the whole process of making coconut oil left me with an increased sense of gratitude and admiration for this amazing plant. The time it takes to grow a coconut and all the work put into the production of one jar of coconut oil is incredible. It’s very interesting to learn how to make cold-pressed coconut oil and I recommend this to anyone who has the opportunity. As my suitcase was packed to full capacity after almost 6 months in Asia and 3 seasons of clothing, I only had room for one liter bottle of coconut oil. It was one of the best coconut oils I have ever tried. After a year, -because I used this one occasionally, so that it would last me as long as possible- it was still delicious. This type of coconut oil always has my preference. I am able to see the production process myself and can gladly support the people who work hard for it. Please take the time to research where your coconut oil comes from and how it was produced. It’s not always easy to trace this, but feel free to contact the producer and ask your questions. With all the different coconut oil names it can be confusing to know what to use. I hope you enjoyed this article about how to make cold-pressed coconut oil!